How do I use the drop image option type? Some of your products may have multiple options. For instance, if you sell clothes in your online store, a sweater may come in red, blue, and green. You may want to create an option that displays a thumbnail picture of your sweater or the color swatch in the different hues when a customer chooses a specific color. Type in the Option label's name. For example, "Available Colors"
Using the "Type" drop down menu, select the one labeled "DropImage"
The final step in our process is to assign the images to the option sets that will display when those options are selected. After creating the option sets, they will be listed under the label created earlier. Within the set listings you will see a column labeled "Opt" and a link for each set labeled "Select." This link will open up the store's file manager so you can browse for and select the image(s) that will be used for the drop image. Using the file manager, click Select for the image you would like to display next to the option. Makes the option pre-selected on the product listing page. Hides the option form the listing page. Adds an additional amount when the option is selected. The part number for the individual option if needed. The sorting number for the option's display. 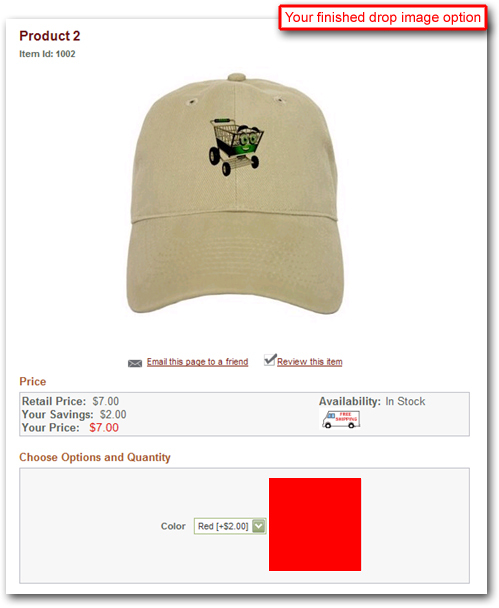 Used if the option is for a Product Bundle where an additional item is added to the order when the option is selected. These settings are available with any option type (not just DropImage). For more complete information on setting up Product Options in general, please click here. After setting up your DropImage options, click "Save" at the top right to commit your changes. In the illustrated example above, we used a simple color swatch to represent the available option color. However, you can also use a small thumbnail image of the product in its available color to further illustrate the option set.